John Cohen at Merle Wood & Associates tells me that, having sold the 27m motor yacht Frailech in late 2009, he signed her for sale again a few months ago and she's now had a $700,000 price drop. Built by Pershing in 2008, she accommodates six guests in three staterooms and her twin 2000hp MTU engines linked to Arneson surface drives power Frailech to speeds of up to 43 knots. 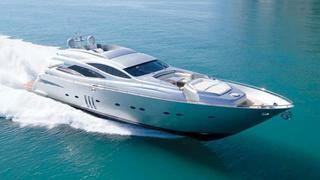 Both engines have factory warranties up to 2014 and the asking price is now $6.25 million.